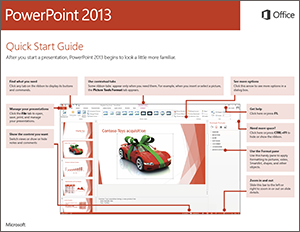 If you’re new to PowerPoint 2013, this free guide offers useful tips to help you find your way around. Need a guide for a different Office product? On Windows 8, clicking the Download button above opens the guide directly in the Windows 8 Reader app, where you can view the guide, print it out, and save it for later reference. Right-click the Download Quick Start Guide button above, and then click Save target as (on some browsers, this is called Save link as). Save the PDF file to your desktop and then open it in your PDF reader.